A special Thank you to Hodder Books and NetGalley for sending me this book to review. Oh, WOW! I'm totally in love with this book. It is so arty and it makes you see life with different eyes. My grandmother is an artist and I took my obligatory Art History course in college, but that is where my art knowledge ends. I have been to the Louvre in Paris though! There are many reference to different pieces of art and Graffiti Moon made me want to know what they looked like. I found myself Googling these art pieces just to see what Lucy and Ed were talking about. The story is told through 3 POV's. Mainly Ed and Lucy but a few chapters filled with Poets poems. It is more than alternating points of view though. Author Cath Crowley takes a step back and we re-visit the scene through the next characters eyes. I loved this. I got to know what both Lucy and Ed were feeling and thinking about the same situation. Perfection. 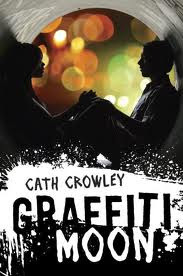 Lucy has just graduated high school and she is on the hunt for Shadow, a graffiti artist that she is in love with. She's never met him though. She is in love with his art and feels like she knows him. Graffiti Moon is a night of adventure! A night of Shadow Hunting with old and new friends. What could happen?! Let me just tell you, I love this book! It stirred so many emotions within me and I was just pulling for Ed and Lucy. I wanted Lucy to find Shadow too. I wanted to see more paintings and I wanted kissing! That is the ONE thing I would change. More kissing. All I needed was one good kissing scene. Really good. To match the rest of the feelings I had stirring within me. But, oh how I loved this book. Brilliant! Pure brilliance! "When wanting collides with getting, that's the moment of truth. I want to collide." The more reviews I read about this book, the more compelled I am to give it a shot. It’s definitely not something I would ever pick up on my own, but sometimes those books do turn out to be the greatest! Ohmygod!!! I just read and reviewed this book, too, and I ADORED it. I even mentioned that same quote because I was totally blown away by how pretty it was, right off the bat. And I do agree with you about the kissing, although I thought there was great chemistry and tension. But yeah, one SOLID make-out wouldn't have hurt anyone! @Darlene DO IT!! You'll love it!! Glad you liked it! It will forever be one of the best books I've read!